"I hope it's not one of those boring 'use pie on cat' type jobs." In the Videlectrix video game world hub, Strong Bad's Cool Game for Attractive People is one of the Videlectrix games that Strong Bad can choose to enter. 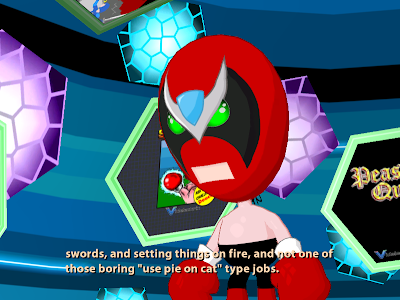 Strong Bad hopes it's an action game full of "guns, swords, and setting things on fire", and not a boring "use pie on cat" type adventure game. This is one of many fourth wall breaks in the game, as well as one of many critiques on the adventure game genre (as well as many other video game genres) in the game.